In a transformer, source of alternating current is applied to the primary winding. Due to this, the current in the primary winding (called as magnetizing current) produces alternating flux in the core of transformer. This alternating flux gets linked with the secondary winding, and because of the phenomenon of mutual induction an emf gets induced in the secondary winding. Magnitude of this induced emf can be found by using the following EMF equation of the transformer. As, shown in the fig., the flux rises sinusoidally to its maximum value Φm from 0. 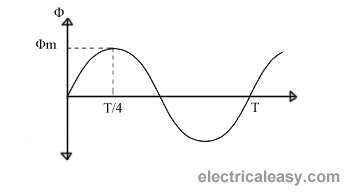 It reaches to the maximum value in one quarter of the cycle i.e in T/4 sec (where, T is time period of the sin wave of the supply = 1/f). average rate of change of flux = 4f Φm ....... (Wb/s). Therefore, average emf per turn = 4f Φm ..........(Volts). Therefore, RMS value of emf per turn = Form factor X average emf per turn. Therefore, RMS value of emf per turn = 1.11 x 4f Φm = 4.44f Φm. This is called the emf equation of transformer, which shows, emf / number of turns is same for both primary and secondary winding. For an ideal transformer on no load, E1 = V1 and E2 = V2 . This constant K is known as voltage transformation ratio. If N2 > N1, i.e. K > 1, then the transformer is called step-up transformer. If N2 < N1, i.e. K < 1, then the transformer is called step-down transformer.